Tomorrow, November 11, is TechCrunch‘s five month anniversary – my first company profile (Technorati) was on June 11, 2005. I’ve been blogging personally for some time but this was my first attempt to write for an audience larger than my immediate family and friends. It’s been a wonderful experience – and I have countless new friends (bloggers, readers, entrepreneurs, journalists and venture capitalists) that I’ve met directly or indirectly through writing TechCrunch. If you’d like to know why I started TechCrunch and how it’s evolved, please read my post here on the companion blog I started, CrunchNotes (CrunchNotes is where I write about stuff that interests me but that doesn’t strictly belong on TechCrunch). I thought I’d share some TechCrunch stats that I find interesting. I’ve always found it interesting that Firefox is the most popular browser of TechCrunch readers, even though their total market share is only around 10%. 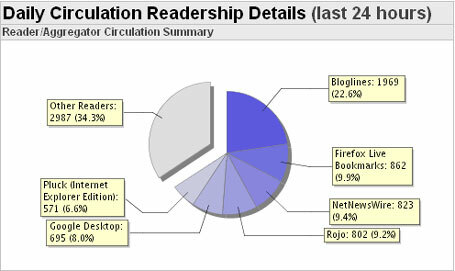 This stuff has to scare Microsoft…blog readers are the early adopters. I want to thank everyone that reads this blog, has been written about in this blog, and the many people who’ve taken the time to link, comment and give me advice. I’ll keep writing TechCrunch as long as it’s fun, and as long as I love what I’m doing (and yes, I am an amateur).